Click here for a PDF version of the White Paper. Feel free to distribute. 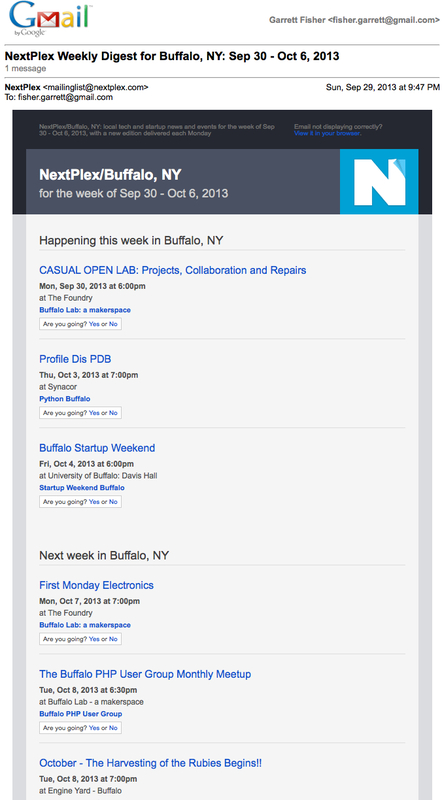 List your self, startup, event, and incubator and so forth on Nextplex. It makes a bigger difference than most think. 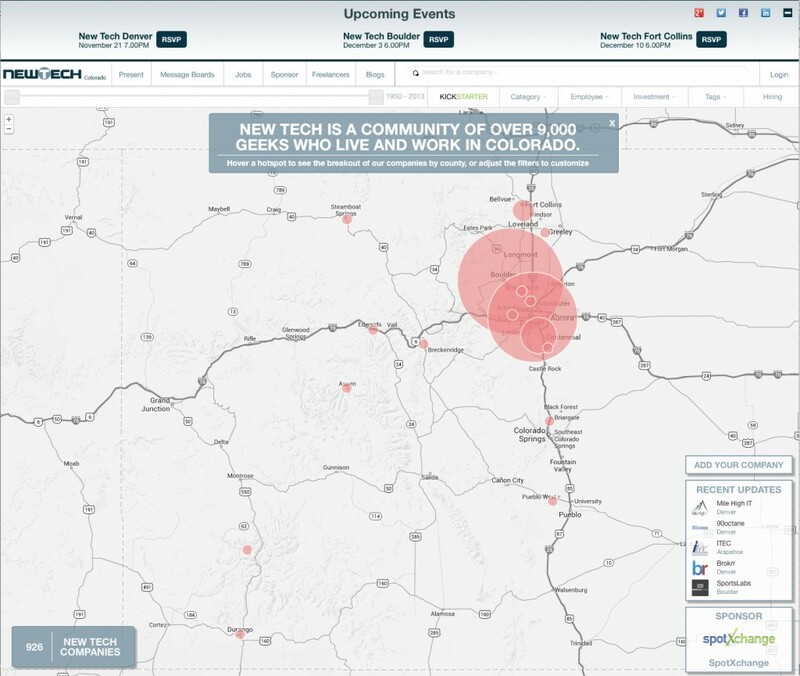 List the same resources on New Tech Colorado – let the Front Range know we’re here. If there is an event in your community where you would like this Initiative pitched, let me know and I’d be glad to come. Drop me a line with your ideas and thoughts. If you wish to host an event or do something big in your community, contact me and I’ll connect you with resources and share knowledge. Colorado resort mountain communities have the perfect ingredients to build local entrepreneurial and startup ecosystems and to attract outsiders to come to the mountain region to enjoy our world-class lifestyle while launching their companies. The main roadblock is that the startup ecosystem will quickly max out in each individual community while falling short of a self-sustaining critical mass. 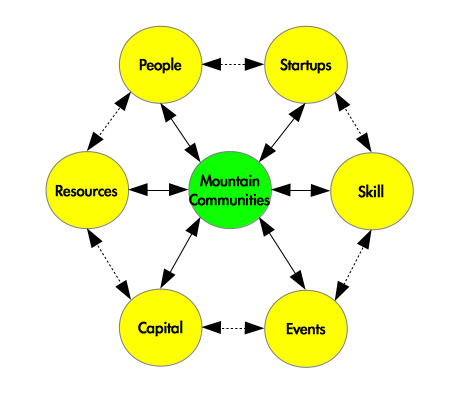 The solution proposed is to connect all mountain community entrepreneurial ecosystems – sharing resources, knowledge, events, and people – and thereby having a community large enough to achieve self-sustaining critical mass despite smaller individual town sizes. Each community would continue to operate its entrepreneurial ecosystem as it chooses to and would not be agreeing to outside terms. The identity of each town dictates what is best – and it is only natural that it remains self-directed. There is an expectation that communities would feel no need to compete for resources. As each community has its own identity, those who move to various towns and the resources that come there will self-select where they belong. Elevation, cost, weather, terrain, proximity to airports and the Front Range, and a host of other factors too numerous to mention naturally ensure that we have something to offer just about anyone interested in coming here and people will select what suits them. Little is accomplished trying to tout one place over another. The essence of the concept is interconnecting whatever startup resources exist and what future ones arrive. Connecting local communities isn’t an overly complicated project. We will be making all members of mountain communities aware of the following resources in our respective communities. By knowing what is happening in neighboring communities, information sharing and collaboration is the natural byproduct. As of this writing, two Startup Weekend events have occurred in mountain towns with a third town up and coming. New Tech Colorado tentatively is coming to two mountain towns. TEDx events have been hosted in a variety of towns and ski resorts. Telluride has rolled out a nimble, capital-oriented accelerator model. Steamboat has been progressively building their startup community for over 4 years. This is just the beginning of a long list of accomplishments that have already happened on their own. We owe it to ourselves to be fully informed of like-minded resources available. A logical question is how to aggregate resources in a useful fashion. After extensive research, I have located what I think is a rather powerful, concise and useful platform that caters to startup communities: NextPlex. I have secured a beta section on the site for “Rockies-CO”; hence, we will be able to have our own self-contained platform in which to function. It is located at www.nextplex.com/Rockies-CO/. 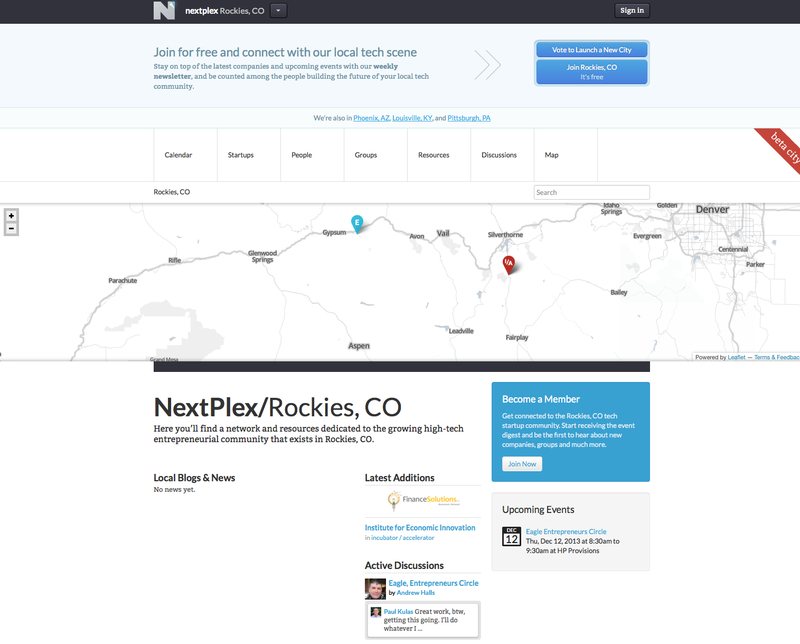 Nextplex aggregates people, startups, events, blogs, resources, capital, incubators, associations, tech press, discussions, conferences, and other items. Events are summarized and a list emailed to all members weekly. 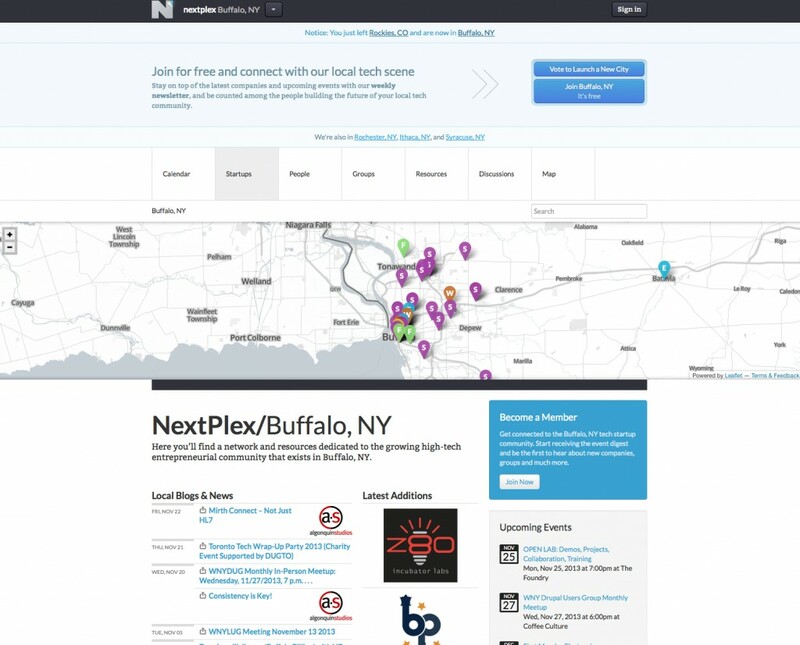 Startups, incubators, coworking, and events are placed on a homepage map. Blogs are syndicated to the front page. Events are auto-streamed from Meetup.com and ICS feeds. NextPlex is the most logical solution to our situation as it is free, has no ads, and does everything we would need it to. I would like to make it very clear that I am not receiving any compensation for the NextPlex platform. Part of connecting local communities consists of information sharing – offering lessons learned and information on what works to other communities. Most of this can be done informally through relationships between organizers; yet, a formal protocol of some nature is meritorious to keep the Initiative functioning on an ongoing basis. As each community experiments with varying components of startup ecosystems, data needs to be shared. For example, as New Tech is coming to Breckenridge for the first time, the pros and cons and challenges of the format in a mountain town will be shared with any other community that wishes to host the same event. What is accomplished is a wholesale reduction in risk. As anyone who has coordinated an event knows, the hardest work is the first time the event is hosted as what goes into it, what works, who will come, and additional data points all get worked out the first time. There is no sense making each community struggle to learn these same lessons over and over. We all benefit collectively when one community is successful – as additional success is more than likely due to drawing in outside influence as opposed to consuming internal resources. After building initial critical mass, there is a risk with startup communities that progress fizzles. My experience with growing entrepreneurial ecosystems is that there needs to be ongoing community feedback as initial success can get confused as something long term when it is merely a new benefit that fizzles once all involved have taken advantage of it. The Community Roundtable will be an open forum where the Mountain Communities Entrepreneurial Initiative is specifically discussed. The plan is to have the event held in differing mountain communities on a quarterly (possibly monthly) basis. It is desired that community organizers attend as well as any community member that wishes to come and offer feedback. The event also would be designed to encourage wider community participation. As of this writing, the concept is tentative and is expected to be refined after being put into practice. Connecting with the Front Range serves two purposes: to bring mature startup resources to mountain communities (capital, events, etc.) and to attract new permanent residents. On the first front, it is logical that the Front Range will maximize resource generation faster than we will. There are multiple metro areas, millions of people, existing venture capital firms, and political resources. As those resources begin to look for a home, the goal is to make our presence known and offer a compelling option for these Front Range resources: to come to mountain communities. At present, a VC round invested into a mountain startup seems odd, if not “out of this world.” Our current presentation is that we are nearly exclusively lifestyle and recreation oriented. By presenting that an investment here is not made off the face of the earth; rather, into a vibrant startup community, it will become the new norm. Front Range event formats brought here bring an easy bridge of ideas. The mountains are already a destination people want to visit, events are familiar, so mixing the two is a no brainer. The reason for having events here is obvious: it is the same that the Front Range has events – connecting people and resources together to catalyze action. We wish to bring the same here. The secondary result of connecting to Front Range communities is the fact that quite a number of people “would rather live in the mountains.” They say so themselves – sometimes honestly, other times spitefully (“it must be nice to live in the mountains”). In either case, there is plenty of demand. Deterring factors are basically jobs and cost of living. While we don’t propound to fix those two issues, it makes sense to roll out the red carpet for entrepreneurs that can make it on their own up here. The number one reason companies choose an area to set up shop is the people, the workforce. Other than economics, individuals generally live in certain areas because they “fit in” and like the people around them. Again, people are a primary draw. For an entrepreneur to move here (which they are the most likely group to have the drive to pull it off), they need to know that like-minded people exist here. There are a host of benefits to attracting entrepreneurs. The current stream of new residents is basically recreation bums and second homeowners. Neither group is overly concerned with the long-term stewardship of the area – they are self-interested as to their part-time or transient tenure here. As second homeowners are more capitalized, they will continue to make it more expensive to be here – and bums will just live in their cars. That future is bleak one: a playground of unoccupied large second homes with international vacation renters where no real people can live. Entrepreneurs have the mindset to pull off living here. They also are generally well educated, successful, and well capitalized. By attracting a group that can live here long-term, communities are making an investment in themselves by bringing good long-term stewards to their communities – people who wish to act and believe that they can cause a difference (as opposed to indifferent acquiescence). Successful businesses will further yield long-term, non-recreation job-creation, which is a serious issue in mountain towns. I have yet to find a negative to bringing more startups to our communities. Note that mountain towns have next to nothing listed. Steamboat has 1. Summit County has 4 (2 are related to my endeavors). It makes no sense as Steamboat’s Ignite community has 400 or so members. Aspen and Telluride have hosted Startup Weekend yet have one or two listings. The list of reasons that this makes no sense goes on. The fastest way to announce our presence is to list startups, service providers, freelancers, coworking, incubators, capital funds and the like. Anyone in the startup community has a slot – and that will count to let the state know we’re here. Further, it can only help a freelancer or consulting firm if they are better known. It’s free marketing. After mentioning this Initiative to a counterpart, he brought up a valid idea that is worth mentioning. Over the passage of sufficient time, as well as while the Front Range continues to grow its entrepreneurial ecosystem and reputation, Colorado as a state could stand to be a viable alternative to the Bay Area and Seattle as a location for startups. Even more than Seattle and San Francisco, Colorado could stand to offer an entire state as an entrepreneurial option – allowing newcomers to choose between our cities and mountain communities – all functioning as one large startup community with interconnected resources. While such a thing may be some time away, it is plausible that it may not be as far away as we would normally think. We already have millions upon millions of visitors to the mountains, an ecosystem of Institutes and contrarian thinkers in the mountains, and a thriving entrepreneurial ecosystem in the Front Range. The ingredients are here – it’s a matter of maximizing them and connecting them together. The timeline mostly speaks for itself. The “Community Roadshow” component is where I anticipate pitching the Initiative to existing event venues at various mountain communities. We are interested in ideas and opportunities for collaboration on many fronts. The Initiative is an evolving one, and any effort toward its success is appreciated.